1. Rub 1½ tsps salt all over the fish. Set aside. 2. Combine the tomato, onion, scallions, garlic powder, ginger, lemon juice, pepper, and remaining salt in a bowl. Mix well. 3. Stuff the mixture in the cavity of the tilapia. 4. Heat-up the grill. Once the grill is ready, spray a little cooking oil on both sides of the tilapia. This will prevent the skin of the fish from sticking on the grill. 5. 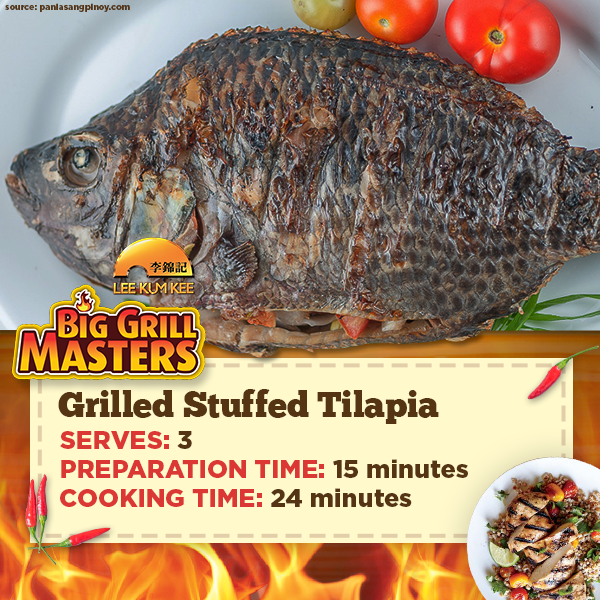 Grill each side of the tilapia for 10 to 12 minutes. 6. Remove from the grill and arrange in a serving plate. 7. On a small container, place Lee Kum Kee Soy Sauce. Squeeze in the fresh Calamansi and top it with chopped sili labuyo. Serve with Tilapia.